Rancho Dominguez, CA - EVS Sports is excited to announce the newest member of our team, Mrs. Sarah Shorter. Sarah comes to EVS with an extensive background in the action sports industry, most recently having worked in outside sales for Haro Bikes. 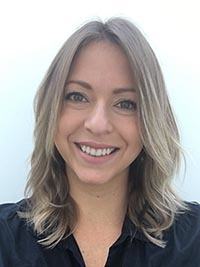 In this new role, Sarah will provide sales and marketing support to EVS dealers in the California region, the number one territory in the country. She will work as an EVS advocate for consumers, dealers, distributor reps and the industry as a whole. With years of experience in the industry, Sarah is a welcome asset to the EVS team. Before her most recent job with Haro Bikes, she spent 4 years working in the accessories department at Motoworld of El Cajon. Sarah’s understanding of sales, marketing and customer service will be a welcome addition to the EVS Team. Sarah is truly passionate about the moto and action sports industry and enjoys spending much of her free time on a dirt bike. She and her husband Josh enjoy packing up the bikes and heading to the desert for a weekend of camping and adventure. When she’s not working or on a bike, Sarah enjoys running, hiking and of course, spending time at the beach.